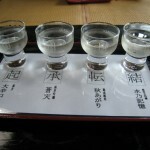 For our first vacation since opening SAKAYA in December 2007, we closed the store to visit sake brewers in Miyagi, Yamagata, and Akita prefectures. 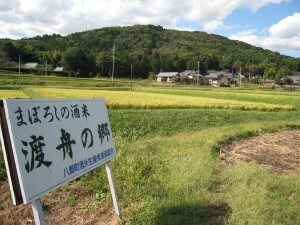 which are located in the Tohoku region well-known for growing rice. 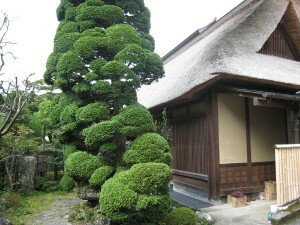 We first visited 287 year-old Urakasumi Brewery located outside of Sendai City, Miyagi. 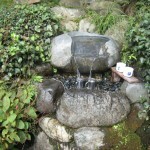 Old fashioned way of straining water using bamboo basket after washing and soaking rice. 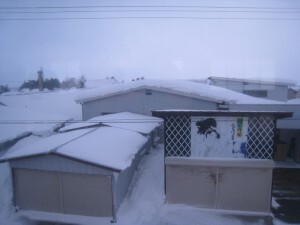 Newspaper journalists taking photo of Rick working. 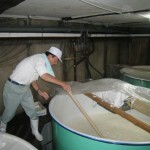 Kamenoi Brewery known for making Kudoki Jozu sake brand. 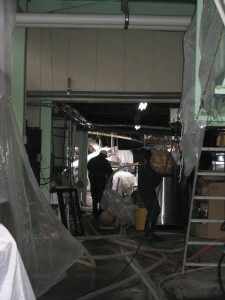 Temperature controlled sake tank for storage. 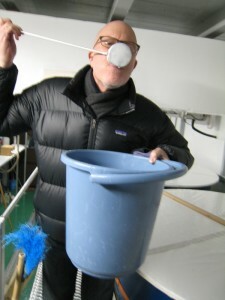 Rick tasting moromi at Kamenoi Brewery. 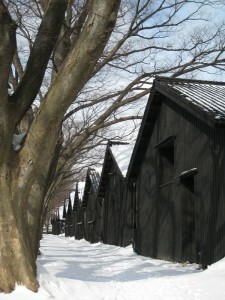 The historic Sankyo Storehouses in Sakata built in 1893 for rice. 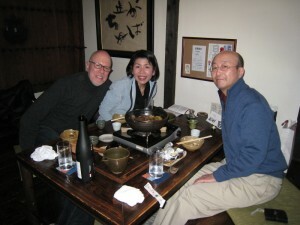 Dinner with Kodama-san, CEO of Kodama Brewery in Akita. 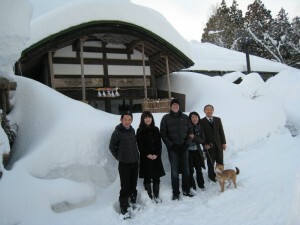 View of Japan Ocean/East Sea with Sait0- san, CEO of Saiya Brewery. 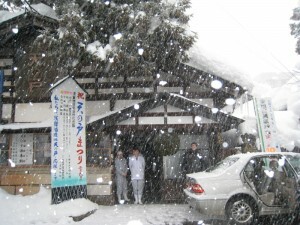 Saiya Brewery in Yuri Honjo, Akita, known for Yuki no Bosha brand. 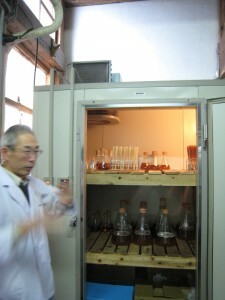 Takahashi Toji talks about sake yeast at Saiya Brewery. 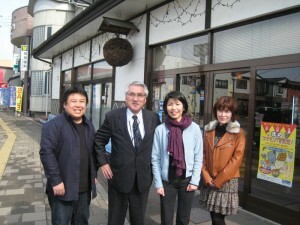 At Asamai Brewery in Akita, known for Ama no To “Heaven’s Door” brand sake. 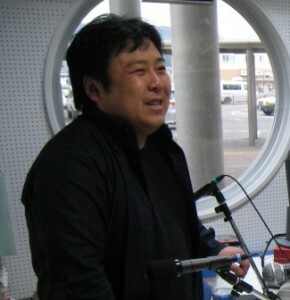 Moriya Toji, brewmaster of Asamai Brewery, famous for his love of cooking, served us some of his otsumami (sake kasu marinated food) with the freshly pressed Ama no To sake. 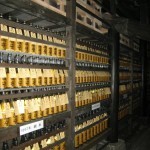 Moromi at Hinomaru Sake Brewery. 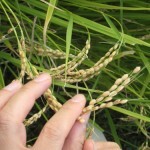 Rice used in this moromi is Sake Komachi rice. 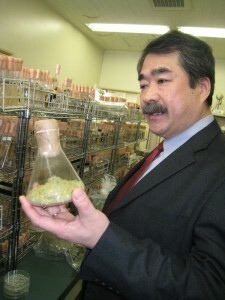 Microbiologist, Dr. Konno with koji mold produced by his company. 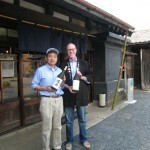 Visiting Mr. Ito, the president of Akita Seishu Brewery, maker of Dewatsuru brand sake at his historic home. 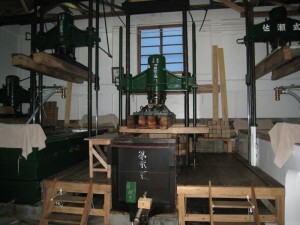 Very old-school fune (sake pressing machine). 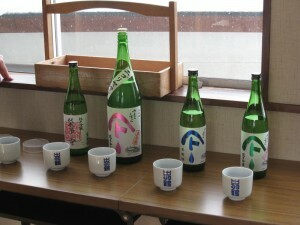 Tasting the newest sake brand at Akita Seishu Brewery. 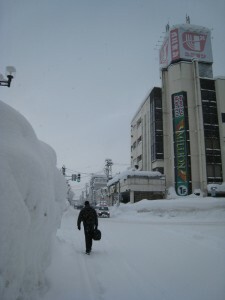 Trying to find Yokote Station on snow covered street in Yokote, Akita. 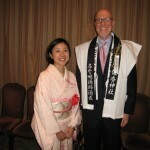 Asahi, Kirin, and Sapporo are well-known Japanese beers familiar to drinkers in the U.S. 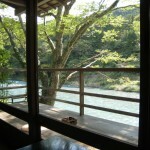 Lately, however, we’ve begun to see more artisanal beers such as Hitachino Nest, Echigo, and Coedo. 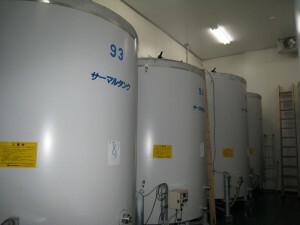 In 1994, the Japanese government eased the regulation on the production minimum to legally produce and sell beer from 2,000 kl (about 17,000 US barrels or 528,000 US gallons) to 60 kl (about 500 US barrels or 16,000 US gallons). 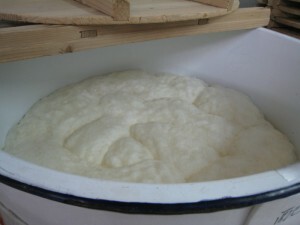 Since then, there have been a number of small brewers popping up which produce high quality artisanal beer. 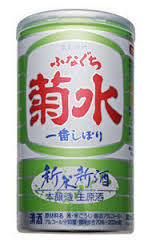 Many are small companies dedicated to producing good quality beer but some are sake brewers who have begun to also brew beer such as Kiuchi Shuzo (founded in 1823) which produces Hitachino Nest. 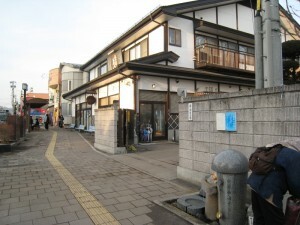 The first such sake brewery to make beer following deregulation was Uehara Shuzo, the producer of Echigo beer (and Echigo Tsurukame sake). 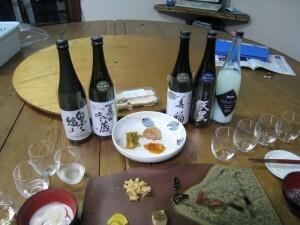 On Hiroko’s recent visit to Japan, she discovered beer made by Umenishiki, the sake brewery in Ehime prefecture. 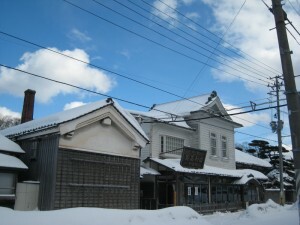 Umenishiki brewery was established in 1872. 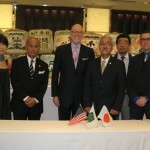 Their Junmai, Junmai Ginjo and Junmai Daiginjo are available in NYC through the importer, Japanese Prestige Sake Import. 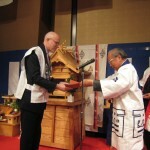 Since 1995, they have also been making artisanal beer which have won medals in Japan’s International Beer Competition. 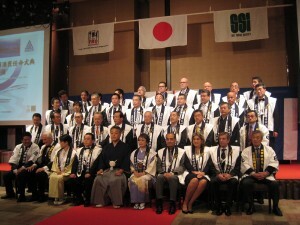 Among the five types that they make, their Bock, Weizen, and Blanse have won Gold, Silver, and Silver medals respectively. 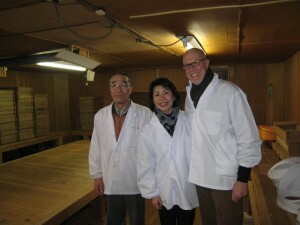 Hiroko picked up one bottle each of the Pilsner and Aromatic Ale to bring home to Brooklyn. Shaken and tossed by luggage handlers, the preservation and condition of the beer might not have been the best, but nonetheless we decided to open and taste them. 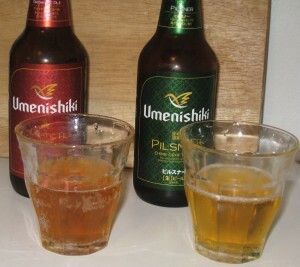 We usually drink pilsners from Pennsylvania and ales from California where the style is very hoppy and aromatic. 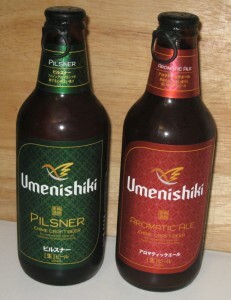 Umenishiki Pilsner was golden in color, very light and tasty with a light fruit flavor and peppery finish. Yet, there was something missing in the flavor. 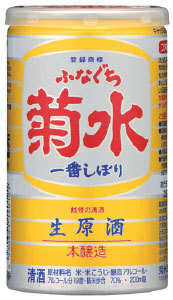 It’s better than Sapporo or Kirin that we drink at Japanese restaurants, but we tend to prefer a more hoppy flavor. We opened the Aromatic Ale next. 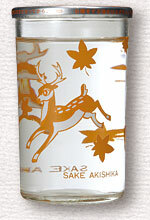 With an alcohol level of 8.5%, it was deep and rich, with a hint of caramel flavor on the back end. 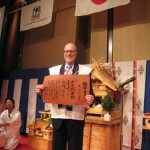 Perhaps had we drunk them in Japan, they would have tasted better. On our next trip, we hope to try their other beers. Still we enjoyed tasting something that is not available in the U.S.and, hopefully, more artisanal beer will be available in the US.